Records Rules Forums Archives Links Merchandise What's New? "A retention means sufficient to hold the rider in the vehicle during a 360 degree roll is required, commencing at WHPSC 2019." While this is not an official IHPVA rule at this time, it is an additional requirement by the WHPSC. We will also be encouraging teams to include in their design a roll-bar or similar structure to protect the rider in the event of roll-over. On July 29th 2018 Nici Walde rode the “M” velomobile to set new Women’s’ and outright 24-hours records of 676.47 miles (1088.67 km). She completed 227 laps of the Opel Test Center in Rofgau-Dudenhofen, Germany. During the ride, she also set new Women’s records for Standing Start 12-hours at 373.477 miles (601.053 km) and for the MegaMeter (1,000 km) at 22:08:39.261 (hh:mm:ss). Record attempts: Sunday Sept 8th - Saturday Sept 14th. Racer/Volunteer Meeting: Saturday Sept 7th. Karen Darke posted successive records of 41.86 mph (67.37 kph), 46.05 mph (74.11 kph) culminating in 46.54 mph (74.91 kph) riding ARION4 in the Women's Arm-Powered Category. Ishtey Amminger rode the CO2 at 60.94 mph (98.08 kph) in the Junior Men's Multitrack category. On Friday September 14, Ken also set a new 200/600 Arm-Powered record of 33.81 mph (54.42 kph). Karen Darke rode the ARION4 for a new Women's Arm-Powered 200/600 record of 30.30 mph (48.77 kph). Last night (Sept 12th) Ken Talbot rode the ARION4, breaking the human powered land speed record at an astonishing 51.58mph (83.02kph). Ken is now officially the fastest human in history riding an arm-powered vehicle! This morning, Karen Darke surpassed her previous world record, reaching 46.05 mph (74.11kph) becoming the second fastest arm-powered human ever. The University of Liverpool team is so proud of everything both riders have achieved, their hard work, their dedication and passion which has led to these incredible records. Early registration closes on August 20th - just a few days away. Register now and receive a $25 discount on your application. An option to pay by PayPal has is now available. Click on the WHPSC button above for the necessary forms and PayPal information. A special dual issue of the two IHPVA publications has recently been mailed to members. In future, these publications will be distributed only by email to current members with an email address on file. Click on the "Join IHPVA" button at the top of this screen if you need to renew your membership and/or keep your email address up to date. Detail information is now available for WHPSC 2018. 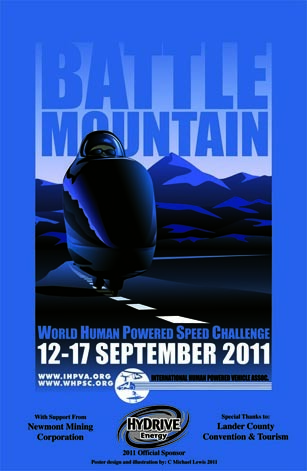 Go to http://ihpva.org/whpsc/ for entry forms, waivers, racer/team information and everything you need for the event. WHPSC 2018 will be held from September 10th-15th at Battle Mountain, Nevada. Details will follow as the event gets closer. WHPSC 2017 is now only a few weeks away. Also, please vist the WHPSC site at http://whpsc.org for comprehensive information about the event. The board has had a long discussion about various aspects of the flying start rules. As a result of this long discussion, we have recently passed two motions. Detailed wording of rule changes remain to be worked out. However, the board felt strongly that the result of these two motions should be communicated without further delay. The first motion concerned launch carts, and the ban on such devices was upheld unanimously. Launch carts were ruled to be a violation of the vehicle integrity rule. We are aware that such a ban may discourage the development of certain HPV designs. However, if launch carts were to be allowed, this could encourage the development of vehicles that become utterly dependent on them to start, and it was felt that is not a direction that the original spirit of the HPV rules should encourage. Furthermore, defining an exception to the vehicle integrity rule could open a Pandora’s box of devices and approaches that also skirt this rule. The second motion concerned the use of skates by launch assistants. The use of skates by launch assistants is banned, effective January 1, 2018. This issue was more controversial, and the vote in favor was not unanimous. However, rationale for the skate ban was the equivalence between the pusher/skater combination with pushers plus a launch cart. The majority of the board felt that if launch carts were not allowed, skaters shouldn’t be allowed as well. We are aware that several teams use skaters for launches at WHPSC. We felt that a delayed implementation of this rule would allow adequate time for teams to retrain their people, and to adjust their vehicle designs if necessary. 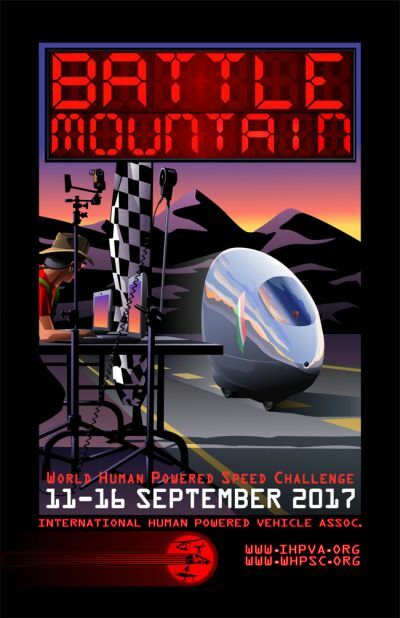 The 18th annual World Human Powered Speed Challenge will again be held in Battle Mountain, Nevada from September 11th-16th, 2017. 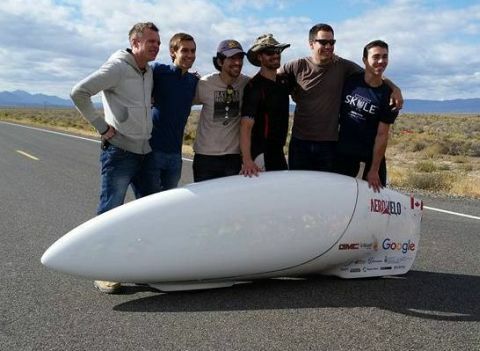 The world’s fastest bicycles will attempt to break the human powered land speed record. The challenge is against the forces of nature and the viscosity of the air itself. The record to beat is an amazing 89.59 mph set by Todd Reichert in 2016 when 10 countries from around the globe came to compete. Teams from France, Russia, Japan, Canada, Italy, Mexico, USA, the Netherlands and Britain, including many collegiate teams, brought their high-tech pedal powered bullet-bikes to achieved amazing speeds setting many National and World records. 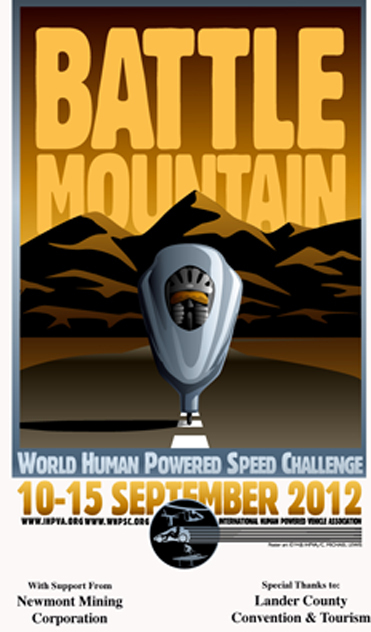 Click here for a full press release:http://ihpva.org/whpsc2017-press-release.htm including information and links for Graeme Obree's film "Battle Mountain" about his experience at the 2013 event. 234.13 miles, 376.79 km at an average speed of 39.02 mph, 62.80 kph. Todd Reichert – Men’s: 88.26 mph (142.04 kph) & 89.59 mph (144.17 kph). Florian Kowalik again rode the Gee Bee to a new Men’s Junior (Age 15 to 17 years) record on September 15th, 2016. His speed of 63.86 mph (102.77 kph) exceeds his previous record of 62.69 mph (100.88 kph), set the previous day. Todd Reichert rode the Eta at 88.26 mph (142.04 kph) to set a new Men’s record. This eclipses his previous record of 86.65 mph (139.46kph) set on September 19th, 2015 at the same location. 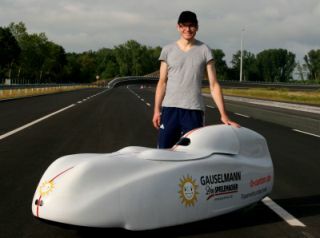 Florian Kowalik rode the Gee Bee at 62.69 mph (100.88 kph) to set a new Men’s Junior (Age 15 to 17 years) record. This exceeds the previous record of 61.45 mph (98.89 kph) set by Mackie Martin at Battle Mountain on September 18th, 2003. Pieter Pas has set a new Men's 1-hour, Standing start, Multitrack record of 43.92 miles (70.68 kilometers) riding the PP3.0. He set the record at the Dekra track in Klettwitz, Germany on July 24th, 2016. The previous record of 36.94 miles (59.45 kilometers) was set by Al Voigt in the Vector in May 1980. 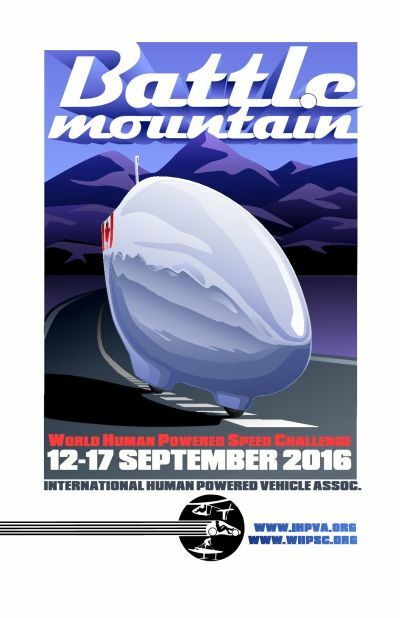 WHPSC 2016 will be held at Battle Mountain, Nevada on September 12th -17th, 2016. An exciting event with several new world records ! 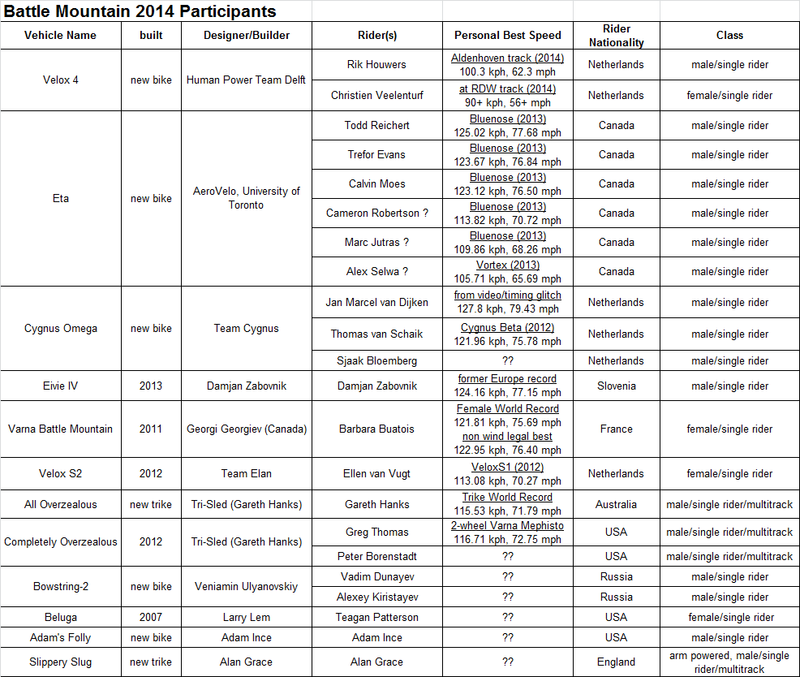 Check out Mike Mowett's Ms Excel-format chart of the results with comprehensive information about each rider and their HPVs. The approved official records are posted on the IHPVA records pages. On Thursday morning, Sept 17th, Todd Reichert set a new Men's 200M record of 85.71 mph in Team AeroVelo's Eta. 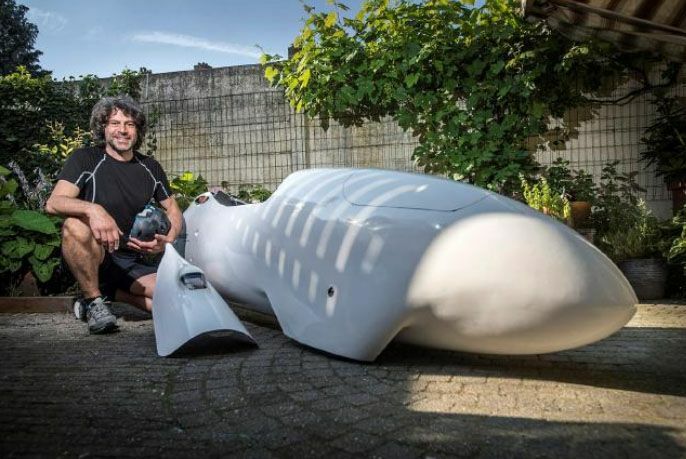 The new record is 2.58 mph faster than the 83.13 mph record set by Sebastiaan Bouwier of HPV Team Delft in Velox 3 on September 14th, 2013. On Friday evening, Sept 18th, Todd set another record at 86.50 mph in Eta. On Saturday evening, Sept 19th, Todd went even faster, recording 86.65 mph. Florian Kowalik set a Men's Junior Multi-track (trike) record of 53.41 mph in Completely Overzealous 2 (CO2). This is the first-time entry in this specific class, which does not have any previous record. Florian susbsequently raised his speed to 57.92 mph on Thursday, Sept 17th. Liz McTernan reached 24.72 mph in an unfaired handcycle, beating the prior record of 21.39 mph, which was set by Michelle Malewicki in 1992. On Tuesday, Sept 15th, Ellen van Vugt set a new Women's Multi-track record of 51.91 mph in Completely Overzealous 2 (CO2) and then raised it on Sept 17th to a second record of 54.453 mph, in the same vehicle. 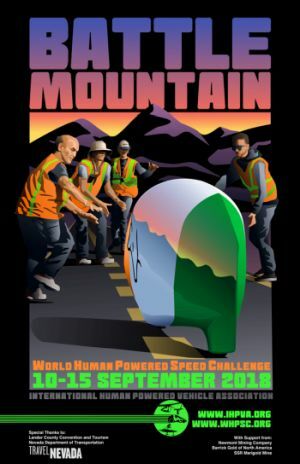 The 2015 World Human Powered Speed Championships will be held September 14th - 19th at Battle Mountain, Nevada for the 16th consecutive year of racing. SR 305 provides one of the straightest, smoothest and most ideal road surfaces in the world for HPV records. The 4,619ft (1,408m) altitude road allows riders an acceleration zone of over 4 miles, enabling them to reach their maximum velocity before being timed over a 200 meter distance. 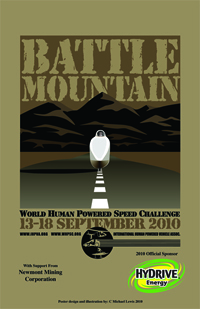 The section of the road used for this event was newly refinished in 2009, with a smooth surface specially prepared for human powered vehicle racing by Frehner Construction and the Nevada Department of Transportation, using a Nevada Department of Tourism Grant from the US government. Click here for a PDF copy of the 2015 Poster. Be sure to follow the action daily and check the event website for links, updates, results and photos. A list of the planned entrants can be seen here. Check out Mike Mowett's unofficial but very interesting lists of riders and records to be challenged. The complete information is also available in Excel format. Contributions to the WHPSC Prize Fund would be greatly appreciated. 1. IHPVA Rule 3.2.3.2 Flying Start has been revised to permit push assists by no more than 3 persons per single rider vehicle with an additional 1 person per additional rider (e.g. Tandem). The complete rules can be found at the IHPVA Rules page. 2. The Start Order Selection Process is detailed here. 4. Note that launch dollies or carts will no longer be allowed at the WHPSC after 2015. During the week of September 8th - 13th, 2014, 22 cyclists from from 8 countries will gather on SR305 outside Battle Mountain, Nevada for the 15th consecutive year of racing on what is arguably the straightest, smoothest and most ideal road surface in the world for HPV records. Be sure to follow the action daily, check the event website for links, updates, results and photos! Barring any unforeseen complications or technical weirdnesses, you should be able to see live coverage from the post racing wrap-up meetings on the USTREAM channel. Please contribute to the WHPSC prize fund. Check out the Facebook groups for the WHPSC and the IHPVA. Baring any unforeseen complications you should be able to see live coverage from the post racing wrap-up meetings here. Find the WHPSC group on Facebook! The IHPVA also has a Facebook group! The IHPVA has established two new competition classes for Junior Riders and Multitrack Vehicles. The purpose of the classes is to recognize prior achievements by younger riders and multi-wheeled vehicles and to promote their activity and development in the future. Achievements in both classes will be recognized retroactively back to September 19th, 1980 – the incorporation date of the IHPVA. The junior classes recognize three age groups – 11 years and under, 12 -14 and 15-17. Multitrack vehicles have three or more contact points with the ground and a minimum track width of 250 mm. This covers the increasingly popular tricycle configuration. They are subclasses of current classes which include men’s and women's, so a junior female riding a tricycle in a 200m sprint would be classified as 200 Meter Speed Trial- Women’s – Multitrack- Junior 12-14 years, for example. For full details of these new rules please go to the IHPVA website and click on ‘Rules’ at the top of the page. During the week of September 10th through September 15th 2012, cyclists from around the world including Australia, France, Russia, Scotland, USA, Canada, and the Netherlands will gather on SR305 outside of Battle Mountain, Nevada for the 13th consecutive year of racing on what is arguably the straightest, smoothest and most ideal road surface in the world for HPV records. The 4,619ft (1,408m) altitude road allows riders an acceleration zone of over 4 miles, enabling them to reach their maximum velocity before being timed over a 200 meter distance. The section of the road used for this event was newly refinished in 2009, with a smooth surface specially prepared for human powered cycle racing by Frehner Construction and the Nevada Department of Transportation using a Nevada Department of Tourism Grant from the US government. Proudly sponsored by Hydrive Energy and brought to you by the IHPVA. Check the event website for daily updates, results and photos! check here for the Hydrive TV commercial! The next issue of HPV News and the 2010 Membership Roster is in the mail, some of you may have already received them. This Year's edition of Battle Mountain has been much anticipated as the stretch of pavement has been completely resurfaced with smooth asphalt. Over the years, cracks in the pavement have been significant enough to blow tires and cause riders to become airborne. If the weather cooperates, new records are anticipated especially after the record setting performances of the Varna Tempest at the Ford Human Powered Challenge. 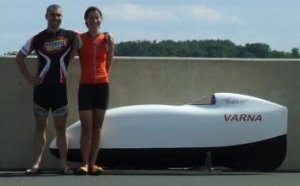 The Varna sponsored hour record setting duo of Sam Whittingham and Barbara Buatois will be competing. HPV great Fast Freddy Markham will also be making a challenge. The competition is open and all competitors can race on HWY 305. Complete information for this event is at the event web site. Several new IHPVA one hour records were set on the weekend of July 18th, 2009 during the Michigan Human Powered Speed Challenge at Ford Motor Company\'s Michigan Proving Grounds, in Romeo Michigan. 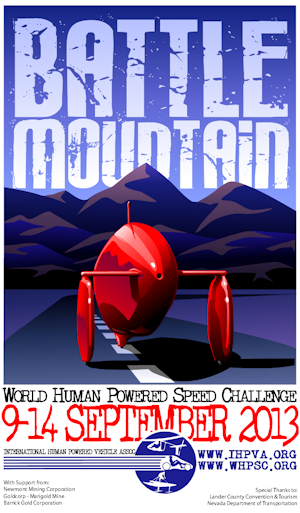 This event, organized by IHPVA board member Mike Mowett was designed to both provide a world class venue for setting records, and to run HPRA style human powered vehicle races for the non-records setting racers. This well attended event represented a return to the large world championships that the IHPVA enjoyed in the 1980s and early 1990s. The bottom line is that the ‘Association of Associations’ concept of the IHPVA re-organization of 1999 just didn’t work as planned and the human-powered community was losing focus, direction and sense of community. The multiplicity of similar names was very confusing, even to those of us within the organizations and it was almost impossible to explain clearly to outsiders. Following the 1999 reorganization, the IHPVA was not a legal entity. It was not incorporated or registered and accordingly has not had legal funding or even the legal foundation for its name. As President of the HPVA at that time and an early Chairman of the IHPVA, I was deeply involved in the name changes and the reorganization. But it was extremely difficult to sustain sufficient enthusiasm to make even parts of the proposed IHPVA structure work. I was not successful in keeping the enthusiasm alive or in forming a legal entity and my successors have all suffered the same fate. The anticipated benefits failed to materialize. The enthusiasm for the concept dropped very quickly, as did the number of volunteers willing to help bring about the proposed change. As the years passed, even the proponents of the 1999 reorganization realized that the change wasn’t working and that substantive action was needed. As Alice Krause has written, HPVA board presented a proposal to re-establish the original name and change the bylaws to reflect the change at the annual HPVA membership meeting in 2006. The membership approval vote was unanimous. The organization has gone back to its origins and reclaimed the name established by its founders. The organization is incorporated as the International Human Powered Vehicle Association in the USA and is registered in the U.K. The plan to reaffirm our mission of promoting human powered vehicles and their technology by inviting the affiliation of the current national organizations into a larger unified community. 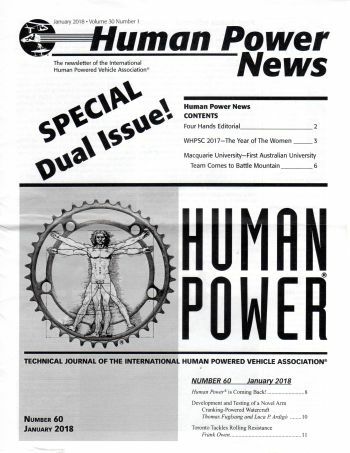 We are improving our publication of information through a restructured ihpva.org website with an open archive of Human Power, the IHPVA technical journal. The website will also publish course records and race and event records, where the event organizers submit the observation and timing information. Online forums are now available to improve communications between individuals and organizations throughout the world. We invite all members of national organizations to become IHPVA members, to volunteer for any of a multitude of tasks in running events and the organization, to run for office if they wish, or to just enjoy the satisfaction of being on the leading edge of human power and its supporting technologies. If you hadn’t noticed the masthead already, please look again. Our organization has gone back to its roots and reclaimed the name given us by our founders. 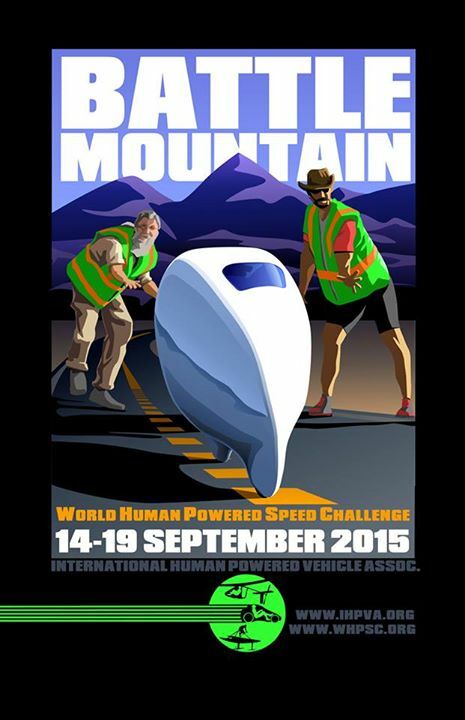 We are officially the International Human Powered Vehicle Association! The Nissan Dempsey–MacCready One Hour Challenge lived up to all the preparation and anticipation by providing suspense and surprise up to the final moments on Sunday July 2, 2006. Beginning June 29, with a 5:00 am advance viewing of the track located at the Nissan North American Technical Center outside Casa Grande, Arizona. Riders were given a tour of the track in vehicles provided and driven by Nissan employees. The three-lane 5.67 mile (9.12 km) oval was steeply banked in the turns and had some very large surface cracks throughout with turn three having a very uneven surface due to some older paving. You guys did it again and kept the Challenge alive. A new European record (go Damjam), and some new to me riders. Wish the Tri-sled machine were running gut (good). Glad to see Larry had a streamliner up and gehen (going). So much for my once a week Deutsche lessons, occasionally I can say something out loud.